Q: What is choreography? What is “park & bark”? How can these tools improve my animation? 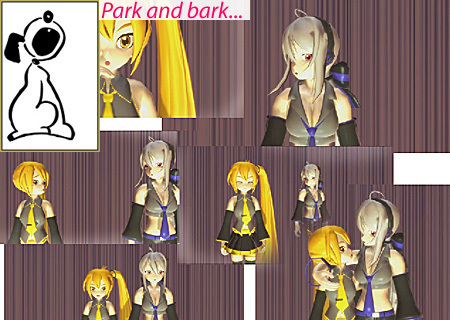 “Park and bark” is not a term you’re likely to hear when using MMD. Choreography is more common, especially since the program was first designed to be a virtual dance studio, but it’s still not a term you will see every day. Understanding these terms can help you improve your animation. Choreography is, for our purposes, defined as planned movement set to music. It can be dancing, aerial stunts, or a gymnastics floor routine. The word “choreography” most commonly applies to dancing or theatre, where being the person who puts the choreography together can be a lucrative career. This is an example of solo choreography. There is a variety of movement throughout the body, and there are relatively few moments where she could be described as “standing around”. Movement is based on individual words and rhythms, and may or may not reflect the words on the song. Of course, this is only one example. Choreography can be extremely complex or extremely simple. WHAT IS PARK AND BARK? The simplest style of choreography can be called “park and bark”. This is an unofficial term. It’s based off of the idea of parking yourself in one place and barking out the words. Park and bark doesn’t always require people to stay in one place for three to four minutes straight. Note that in this animation, the movement is quite simple. The moves also generally relate to what is being talked about in the song. “Secondary characters are calling the shots while the guys are snacking off stage,” for instance, has the characters gesturing off stage. Complex movement is rare. HOW DO THESE APPLY TO MMD? These terms are from the theatre world, not the animation world. They were created with humans, not models, in mind. As I implied above, MMD was designed to be a program to animate dancing. This means there are many people making or tracing choreography for MMD. Park and bark animation is also common. There are probably more park and bark motions than there are choreographed motions, just because they are faster to make. However, park and bark can get boring. WHICH ONE SHOULD I USE FOR MY PROJECT? If you are a beginner, it doesn’t matter if you do park and bark or choreography. Just do what you like. No option is worse than the other. These are tools, not rules. What is the genre and style of the music? What are the lyrics? What do they mean? What sort of mood does the song create? How much time do you have to make the animation? How long do you want to spend on it? It’s important to note that park and bark is not always faster to animate. Putting in a lot of detail can make it just as time-consuming as full choreography, but the detail can make your motion look better. Here is how I might have filled in the questions for Secondary Characters. The genre is Broadway. The style is simple. The only instrument is a piano. The lyrics lament the fact that these two are secondary characters. There are many theatre jokes in the lyrics. The mood is cute and casual. It doesn’t take itself seriously at all. I don’t have a lot of time. Studying is more important, and I have so much studying to do. I’d like to spend a month, at most. These questions don’t tell you the option you should choose. They only help indicate what might be more useful. Check out these animations. Are they park and bark or choreography? Answers are below. Answers: A) Park and bark B) Park and bark C) Choreography D) This one’s debatable. There are no standard definitions, so it could be either. 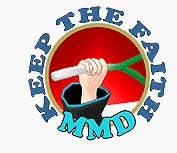 Keep the terms in mind as you watch MMD videos; as you create your own.